UN Secretary General Ban Ki-moon has condemned Israel's blockade of Gaza saying it caused 'unacceptable sufferings,' during a visit to the area. Mr Ban's visit comes as part of a two-day regional tour in which he has encouraged Israeli and Palestinian leaders to revive the peace process. 'I have repeatedly made it quite clear to Israel's leaders that the Israeli policy of closure is not sustainable and that it's wrong,' Mr Ban told reporters in the town of Khan Yunis. 'It causes unacceptable sufferings to ... the people and population' of Gaza, he said. The UN chief crossed into the territory this morning and expressed solidarity with the plight of the Palestinians. This was his second visit to Gaza since Israel's 22-day offensive on Gaza aimed at halting rocket fire ended in January 2009. Mr Ban also toured some of the hardest-hit areas of Gaza before inaugurating projects to build 150 homes, a flour mill and a sewage treatment plant, all of which he said were approved by Israel in recent days. However, Mr Ban said more reconstruction was needed, calling the projects a 'drop in the bucket'. 'I have seen much damage (to many) houses, it is quite distressing,' he said. 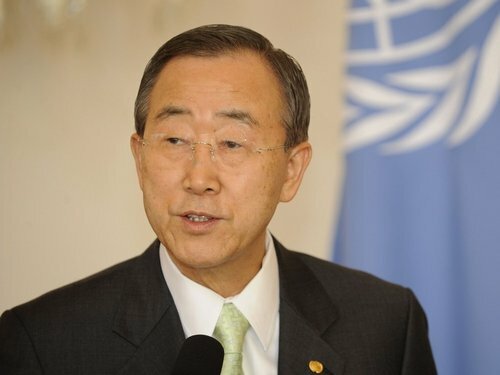 In the West Bank yesterday, the UN Secretary General had said his visit to Gaza was to show his support for Palestinians. 'I'll go to Gaza ... to express my solidarity with the plight of the Palestinian people there and to underscore the need to end the blockade,' Mr Ban said. He insisted ahead of a meeting with Israeli President Shimon Peres yesterday that the closures imposed 'unacceptable hardships' on civilians. 'I understand and share Israel's concerns about the challenges posed by Hamas, but Israel's blockade continues to impose unacceptable hardships while empowering extremists," he said. Meanwhile, two Palestinians have been shot dead by Israeli troops in the West Bank. The Israeli army said the Palestinians had attempted to stab a soldier when they were fired on. Their deaths bring to four the number of Palestinians killed in the past two days in the West Bank. Elsewhere, US President Barack Obama has invited Israel's Prime Minister Benjamin Netanyahu to meet him in Washington on Tuesday to discuss Middle East peace efforts.